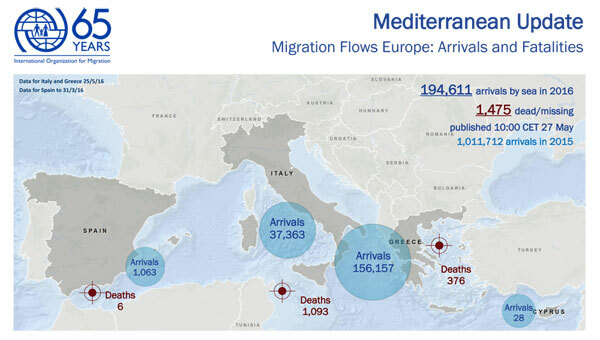 Italy - IOM reports an estimated 194,611 migrants and refugees have entered Europe by sea in 2016, arriving in Italy, Greece, Cyprus and Spain, through May 25. Fatalities – including some 100 still missing – IOM estimates at 1,475 through 26 May 2016. Flavio Di Giacomo of IOM Rome notes that 37,363 migrants and refugees arrived on Italian shores through 25 May, including all rescued individuals brought ashore so far this week. That total will certainly climb today (27/5), as some 10,000 migrants and refugees have been rescued in the region since Monday, 23 May. IOM Rome reports that over two days this week, 25 May and 26 May, dozens of migrants lost their lives in three separate accidents in international waters. One incident, occurring on Wednesday in Libyan waters, involved a steel-hulled fishing boat carrying over 600 migrants that capsized as the Italian navy ship “Bettica” was preparing to transfer the migrants. In cooperation with the “Bergamini,” another Italian navy ship, Italian authorities managed to rescue 540 migrants. They recovered five corpses. The rescued migrants were taken to Porto Empedocle. According to eyewitness accounts of the incident, some 100 people are believed to be missing. Witnesses reported that the boat may have been carrying as many as 650 passengers. They added that the vessel set sail from Sabratha, Libya, on Tuesday evening. Witnesses said that the majority of migrants rescued are Moroccans. On Wednesday a group of 130 migrants, who arrived in Lampedusa, reported to IOM that seven passengers died on another boat, most likely due to fuel spills from the engine. Among the deceased was a Nigerian mother traveling with her 9-month-old daughter. The baby survived and is now in the care of doctors at the reception centre in Lampedusa. Yesterday evening another shipwreck took place in the channel of Sicily. The Spanish ship “Reina Sofia,” which was patrolling the area in the framework of the EU’s Operation Sophia, spotted a capsized wooden boat. At least 77 migrants were rescued, while at least another 30 remain missing.